Often referred to as Bruxelles in France, Belgium's proud capital city lies at the very heart of the crossroads to the whole of West Europe and as such, Brussels is easy to reach from many different European destinations. 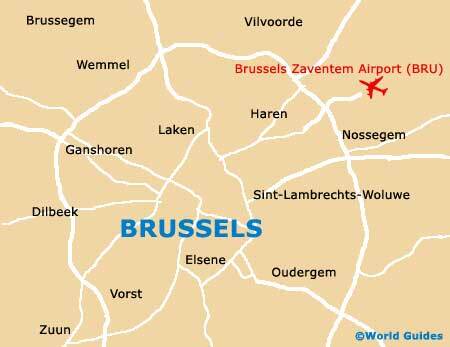 Due to its unusual location, Brussels is a truly cosmopolitan city and home to a wealth of different nationalities and cultures. For many, Brussels appears as a very confident city, although manages to stay quite modest at the same time and does not flaunt its undeniable tourist appeal and endless sights. Many important Flemish institutions have based themselves within Brussels, such as the Flemish Parliament itself. However, for tourists, it is the laid back Belgians, relaxed pace of life, friendly atmosphere, beautiful architecture, rich chocolate and frothy Belgian beer that combine to make this city so very inviting. The latest in the way of tourism is available at the branch of Tourist Information Brussels, which for many simply goes by the name of TIB. Situated on the historic Grote Markt public square, the TIB is a good place to start your visit and offers various discounts, including the popular Brussels Card, which visitors find to be a worthwhile purchase. 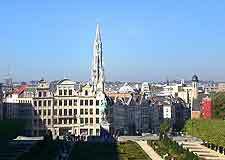 A good way to get an understanding of the city's layout is to take a guided, double-decker bus tour around central Brussels, passing the attractions of Royal Square and the rather splendid Triumph Arch. Make time to visit the Brouwerij Belle Vue brewery and sample this esteemed Belgian beer, or visit Bruprack, where you will find the Oceadium water park, the simply huge Kinepolis cinema, the breathtaking Atomium structure, and Mini-Europe - a collection of scale models of famous buildings from all over Europe. 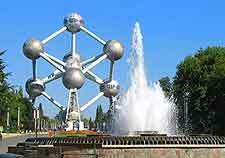 More information about Brussels Tourist Attractions. 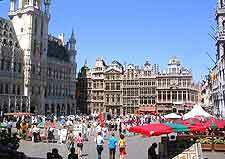 Many of the most historical landmarks reside within central Brussels and around its Grote Markt square. One of the most photographed sights stands in this part of the city, the iconic bronze of a young boy urinating that is named the Manneken Pis. Also this statue is quite small, queues of people flock to see its unusual costumes in which it is often dressed. For something a little grander, Brussels has plenty to wow you with, such as the Egmont Palace, the Bourse de Bruxelles (Stock Exchange) and the regal Royal Palace, which was built in the latter part of the 18th century and was once the residence of the Belgian monarchy. More information about Brussels Landmarks. The huge number of museums in Brussels cover an equally large number of topics and impart a range of information. Belgian chocolate is celebrated at the Museum of Cocoa and Chocolate (Cacao en Chocolade), while an extensive collection of dinosaur fossils are exhibited at the Belgian Institute of Natural Sciences. If you are in the mood for art appreciation during your stay in Brussels, then several galleries stand out from the crowd, such as the Palace of Fine Arts (Palais des Beaux Arts) and also the Royal Museum of Fine Arts of Belgium - the city's biggest museum complex. 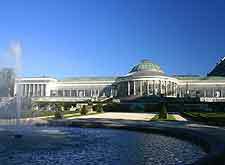 More information about Brussels Museums and Brussels Art Galleries. Make time to see more of Belgium and plan a few day trips outside of Brussels. The city of Antwerp is a particularly popular excursion and features many tourist attractions both lining the banks of the meandering River Scheldt and based around its Grote Markt (Grand Place). Also close to Brussels are the towns of Leuven and Tervuren, where the Royal Museum of Central Africa is an outstanding highlight. To the south-east, the Foret de Soignes is a spreading forest, with well-planted arboretums and even summer tram rides. 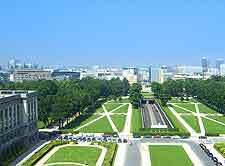 More information about Brussels Attractions Nearby.